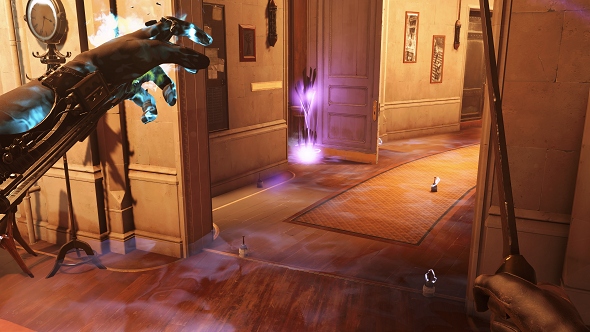 In Dishonored: Death of the Outsider, protagonist Billie Lurk has a power named Semblance. Using it, she can take the face of any NPC and wear it, wandering uninhibited wherever it makes sense for that person to be. It’s a central power in the forthcoming game. But when it was first pitched by the game’s leads, Arkane co-creative director Harvey Smith was dubious. 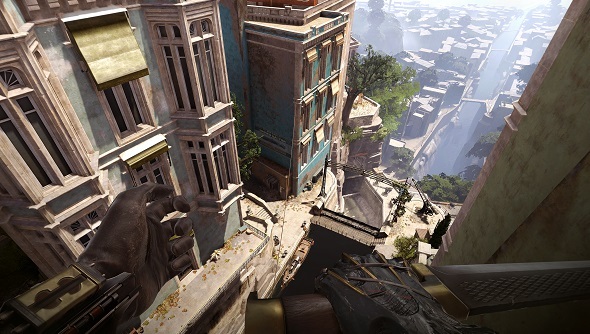 Read more: the best stealth games on PC. 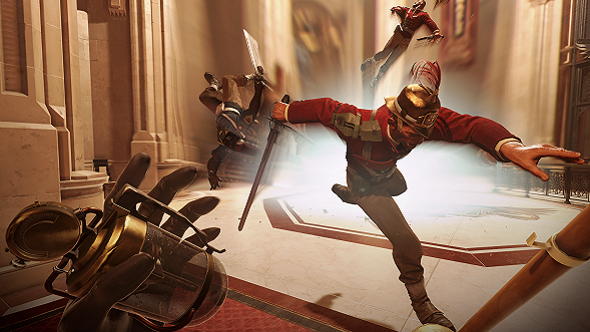 It couldn’t have helped that Arkane had already attempted a social stealth sequence for Dishonored 2, but it hadn’t worked out. It’s not the first time social stealth has been dropped from a game. In fact, it’s always proven difficult. About ten years ago, game designers couldn’t stop talking about the idea. What if, the argument went, there was a way for a game character to be evenlessconspicuous than three points of intense green light glowing from the shadows? It sounds crazy, we know, but perhaps instead they could blend in; hide in plain sight. What kind of new gameplay possibilities would emerge from such an idea? Assassin’s Creed led the charge. Gone were Sam Fisher’s excessive eyewear choices, replaced by the option to fade away into a small group of monks wearing roughly the same clothes as you. It felt unbelievably exciting in 2007, and threatened to catalyse all manner of new stealth gameplay ideas. But Assassin’s Creed never really seemed to get over the crowds thing. Gradually, it became apparent that those segments were the least entertaining, and they were backgrounded in favour of unambiguously fun stuff like pirate ships and Biblical quantities of stabbing. A version of Splinter Cell: Conviction, meanwhile, in which an AI-governed crowd replaced shadow and light as a central mechanic, was scrapped. Only Hitman has remained consistently committed to social stealth since. With the right costume change you gain permission to act in new ways: as a barman you’re allowed to serve NPCs suspicious drinks, and as a security guard nobody bats an eyelid if you walk into a restricted area. But, of course, you have to wrest the costume away from whoever’s wearing it first. It turns out limitations like these are essential to making social stealth doable. 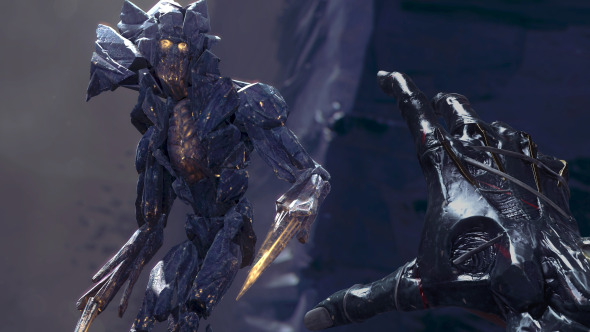 The Death of the Outsider team kept iterating after Smith’s feedback, and gradually they reduced the ramifications of their new ability to something more manageable. It remained a mammoth task: there’s plenty of unique dialogue that comes about through combinations of faces and NPCs. But thanks to its constraints, Semblance works. The NPC whose face Billie steals using Semblance fall immediately unconscious, and moving their body breaks the spell. Moreover, if a guard discovers that victim, they quickly realise there’s something odd about the second version of that person they’ve seen pottering about the place. Trouble soon heads your way. Successful use of Semblance requires patience. Perambulating through the streets of Karnaca beneath the rarefied skin of a noble, I enjoyed the kind of respect Lurk isn’t usually afforded. But I soon noticed that the spell was gradually draining mana, and eventually I’d be exposed – right in front of the patrolling guards on the pavement. I broke into a run, and the mana drained even faster. Which is when I realised Semblance is intrinsically related to speed: stand still, and you can wear a face forever. After breaking into the house of Shan Yun – an opera singer with an unlikely link to a cult important to Lurk and Daud’s quest to destroy the Outsider – I made my way upstairs slowly and deliberately. The face of a kitchen staffer could only take me to the first floor, where I watched and learned the patrol routes of Yu’s guards. From there, I hid in a storage room – stuffed with cast-off art only the rich could consider junk – and was able to recharge my mana before taking on the guise of a guard. Earning a salute from a colleague as I ascended the central staircase to the top floor felt like a quiet victory. Perhaps social stealth’s problem back when it was being toyed with ten years ago was that it relied on the idea of anonymity – the faceless bustle of the city. 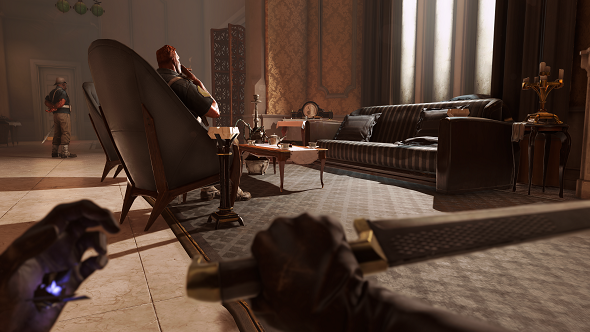 Here, social stealth is interpersonal: to get where you need to go in Dishonored using Semblance, you have to think about whose face you’re stealing, and what kind of relationship they have with the people whose paths you’re going to cross. Perhaps that’s why it works now where it so often didn’t before. “I have to say it’s one of the coolest things in Death of the Outsider,” Smith says. “In my most recent playthrough, almost on the final version, I found myself using it more than I expected. In a major scene that is pivotal to a Death of the Outsider mission, I took one of the two major characters – caught him alone, which is hard – and took his face. I walked out and stood in front of the other major character in the mission, and she totally interacted with me as if I were Brother Cardoza. It felt shockingly intimate. I had all these emotional reactions to it and then hustled away.